Colorado law provides for the creation of a downtown development association (DDA). A DDA typically focuses on improving the infrastructure of the downtown area within the DDA boundary, and the organization is granted authority to develop or redevelop these areas. Here is the Nederland DDA Plan of Development. 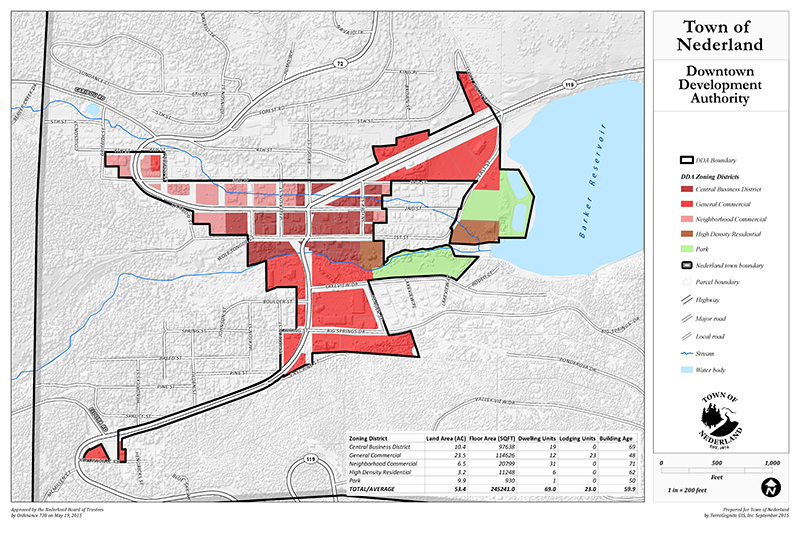 In 2005, Nederland voters within the NDDA district approved, by a 3 to 1 margin, the creation of a DDA with the specific goal of promoting development and improvement of the infrastructure of downtown Nederland. Read Ordinance 599, which recognized the need for a DDA: Town of Nederland Ordinance 599. The goal of the NDDA is to enhance and improve the downtown area within the NDDA boundary, focusing on the ‘nuts and bolts’ of infrastructure. Read the Nederland DDA Bylaws. The NDDA is a component unit of the town, and NDDA board members are directly appointed by the Board of Trustees. Read the BOT Working Agreements. The NDDA is not a membership-based organization and does not charge dues. Who are the NDDA Constituents? Constituents are property owners and business lessees within the boundaries of the NDDA. The NDDA is not a member-based association. If you own property, or a business within the boundaries of the NDDA, you qualify to serve on the Board of Directors. Here is the Resolution #702 Concerning Boundaries. The NDDA consists of a 8 member volunteer Board of Directors who are appointed by the Nederland Board of Trustees and who are comprised of property owners, business lessees, and one member of the Board of Trustees who serves as a representative to the BOT. Members serve for a term of four years. Read the Colorado State Statute. Current members of the Board. How to apply for NDDA Board Membership? At this time, to be eligible for the Nederland Downtown Development Board, the applicant must own real property in the district within the municipality or be a business lessee. Business lessees must be in compliance of all Town and State Laws, including possession of a local business permit. For more information, read the Board Member Qualifications and Responsibilities. Are you interested in being considered for the Board? 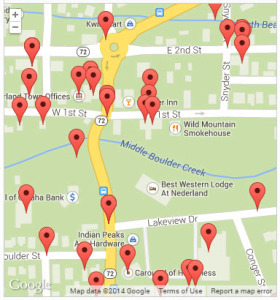 Download an Application or pick one up at Nederland Town Hall. An applicant can expect to participate in a minimum of one meeting each month, on the 2nd Wednesday of the month at 6:00 pm, in the Multi-purpose room of the Community Center. Historically, these meetings have lasted for approximately 2 hours. Further, there may be special meetings called by the Chairman on other days and times. In addition, the applicant is expected to volunteer for a committee or Task Force to help with the projects passed by the Board. Applicants will be interviewed by the NDDA Board in June of each year, and will then be present for the appointment by the Board of Trustees before June 30. The statutory year for DDAs is July 1 to June 30. The term of office is for 4 years, and begins on July 1 and ends June 30, unless the appointment is a replacement of a board member. Public comment will not exceed 30 minutes. Members of the public should register prior to the start of the meeting. During public comment, the Chairperson will call each individual registered. Members of the public have up to three (3) minutes to address the Board in public comment of non-agenda items. Members of the public will have up to three (3) minutes to address the Board on agenda items. Members of the public not registered or have additional comments will be allowed one (1) minute. Please observe proper decorum to help us keep meetings respectful and productive. Please respect our need to conduct a productive meeting by remaining silent during the remainder of the meeting. Persons other than members of the NDDA and Town officers can only address the Board upon recognition of the NDDA Chairperson. THANK YOU FOR RESPECTING THESE GUIDELINES! Where do the NDDA funds come from? Mill Levy- The mill levy is a self-imposed tax of 5 mills, approved by voters within the DDA district, which is voted on every seven years. Tax Increment Financing (TIF) – TIF is a unique tool, allowed by state law, for communities to capture a portion of property taxes from a designated area so that the money can be reinvested in that area. This ensures that the dollars spent in this area will be used to improve development and infrastructure for the benefit of the public. The TIF portion of NDDA revenue is funded solely from property tax on properties within the NDDA’s boundaries. Projects undertaken by the NDDA must also be approved by the Nederland Board of Trustees, but the funds come from only the DDA property tax payers (not all Nederland residents). TIF is not an additional tax, rather, it is the difference or increment of tax received in the defined area from the day the NDDA is approved to the day it ends 25 years later. All the revenue generated by the redevelopment within an urban renewal district reverts to the normal taxing entities when the urban renewal district sunsets at the close of 25 years.